The Environmental Portrait that I did of Konstanze is not written in a descriptive way where I would portray every objects one by one, I decided not to mentioned these objects in her room because she is not about appearances. I wanted to deeply focus on her personality, threw her minds and her strong believes, in a concrete but also conceptual way. Keepig the formal and informative aspect of the newspapers was really key to me. Beeing to direct would not feat with the format, and also it would be to intimate for her modest personality . 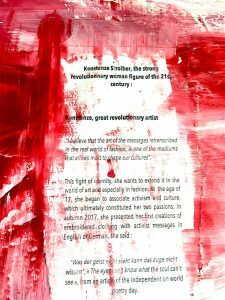 I choose to paint the newspapers in white and red because these are her favorite colors and I think it really goes with her revolutionary believes (red being a strong color), and white representing her sweet personality. 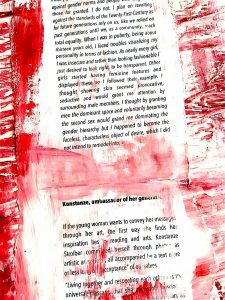 I didn’t painted randomly, we can see a little bit of writtings under the painting because she really likes reading them and she is strongly politically oriented and never got influenced from the medias that are sometimes fake. Thats why I painted on top of what is said, that means that she creates barriers between what she read, and what she remembers and tries to have her own opinion. “I believe that the art of the messages retranscribed in the real world of fashion, is one of the mediums that allows most to shape our cultures”. “Was der geist nicht sieht kann das auge nicht wissen”, « The eyes can’t know what the soul can’t see », from an article of the independent on world poetry day. 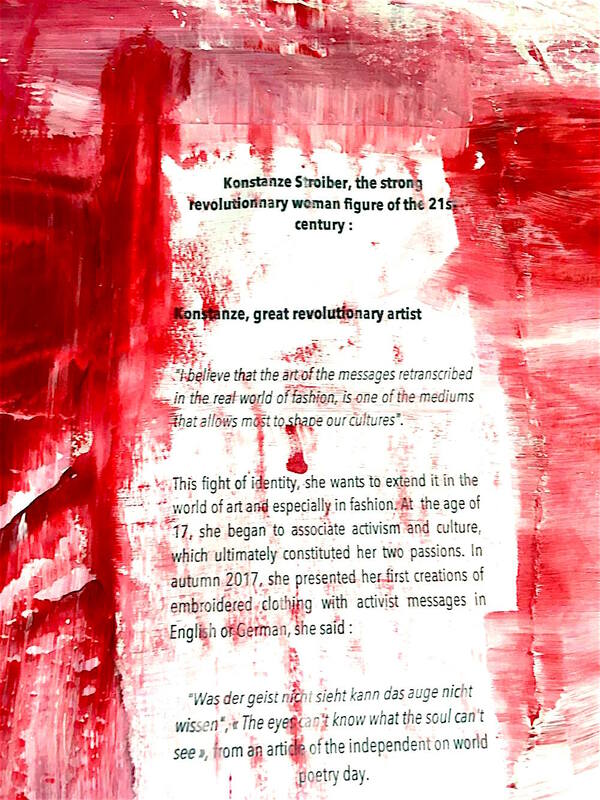 Very early in her way of thinking, and in her commitments, Konstanze revealed her audacious side by asserting her femininity in the eyes of all the world in the magazine the “ELLE” in Austria, unfolding the curves of her body in a serie of large-format prints, reinterpreting those of the artist Yves Klein and her fingerprints of pulpy women. 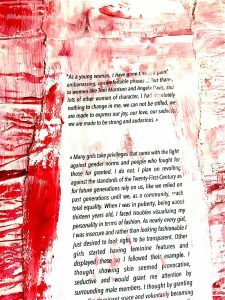 If the young woman wants to convey her messages through her art, the first way she finds her inspiration lies in reading and arts. Konstanze Stroiber committed herself through photos as artistic as societal, all accompanied by a text more or less long on “acceptance” of ourselves. “Living together and respecting each other » is the universal message that she constantly discloses. And if she considers some Afro-American stars as role models, Konstanze becomes a model for young people of her generation. Through her notoriety, she speaks on behalf of all these African-American girls and women, on behalf of young people who feel different about their sexuality, their physical, their social life. For the young woman, fashion design is not just a visual form of self-reflection as it also reflects the social and political changes our community undergoes. She is fascinated by the clash of different cultures, and thats why she applied to the pretigious « New School » of fashion Parsons Paris. 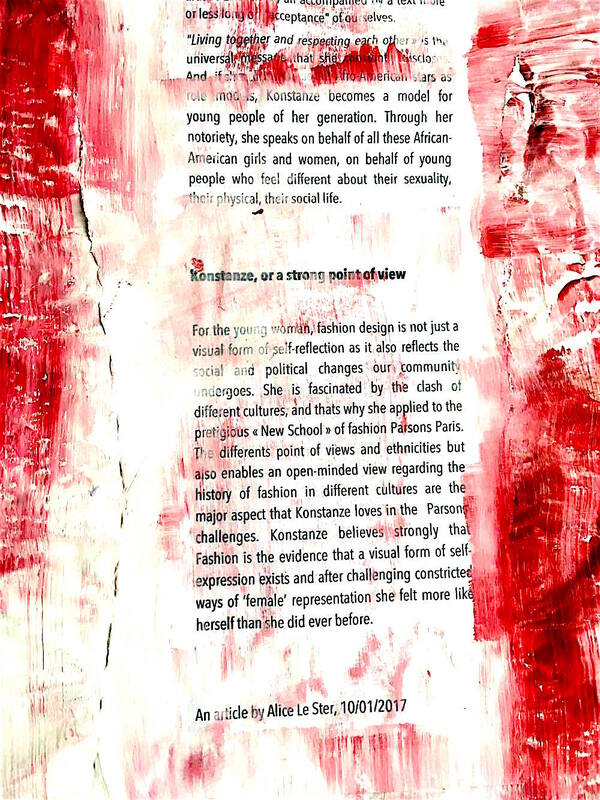 The differents point of views and ethnicities but also enables an open-minded view regarding the history of fashion in different cultures are the major aspect that Konstanze loves in the Parsons challenges. 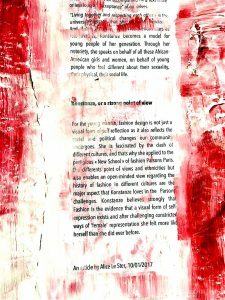 Konstanze believes strongly that Fashion is the evidence that a visual form of self-expression exists and after challenging constricted ways of ‘female’ representation she felt more like herself than she did ever before.